I just became a Scrum Master and will have my first Retrospective ever. What I find difficult for the beginning – I’m sure this will change after doing some Retros – is the transition from Set the Stage to Gather Data. After setting the stage, how do I go the Gather Data? Do I simply say “thank you, now, we’ll continue to gather data…“ or do I comment anything from Set the Stage to Gather Data. What was your biggest insight during the last sprint? -> Thank you! Now let’s look into what other observations you have made with $activity. Of course, the transition has to also match the activity you’re leading to in “Gather Data” (GD). But yeah, usually the sticky notes from StS just keep hanging on a board and are not re-used. If people have the same point again for GD, they can rewrite the sticky or re-hang the existing sticky note. I don’t care either way. When I facilitate for a team for the first time or in a conflict situation I like to test the waters with ESVP: Do people want to be here? How much engagement can I expect from them? If I expect problems, I might use Constellation or Team Radar to explore questions like “How likely are you to speak openly?”. It might be necessary to adapt these to a written form that participants fill in anonymously. The important thing is that you have to be willing to deal with problems that come up. What if half the participants are Prisoners – How will handle it? What if nobody dares to speak openly – What will you do? In short, you’ll have to have at least a rough idea of a Plan B. The more problems you expect, the more solid your Plan B needs to be. Related to the previous case: Some activities are about the retro on a meta level, e.g. asking for Outcome Expectations. I’ll try to help meet the expectations or at the very least check if they’ve been met or not throughout the retro. There are some data heavy StS activities in Retromat that can easily be fleshed out for use in GD, e.g. Amazon Review or Postcards. Don’t be limited by the phase that is assigned in Retromat. There are many activities that can arguably that also fit into a different category. Actually, when you look at my retrospectives individually, you’ll usually find only 4 to 4.5 distinct phases in them. The middle three phases kind of bleed into each other. Which one I stress varies. But whatever I do, you can spot Lean Coffee in each one of them, just rarely as a standalone technique. Anyway, the above are all the special cases I can currently think of. Do you have any to add? How do you transitien between StS and GD? Thank you for the question, Claudia! It was fun to think about this! I’ve got a confession to make: I think fun in retrospectives is overrated. And I never bring cookies, when I facilitate. Don’t get me wrong, I prefer having a good time to moping about and yes, I prefer participants to be in a good mood. Light hearted people are more creative and willing to try new things. 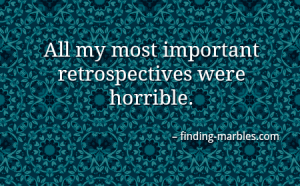 But all my most important retrospectives – the ones I still remember years later – were horrible! Or at the very least deeply uncomfortable. That holds true regardless of whether I facilitated or was a regular participant. 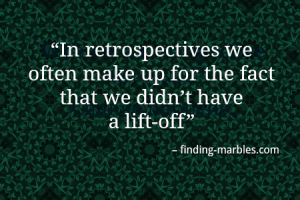 The important retrospectives, the ones that really counted and made a profound difference were about troubling topics: When something or someone wasn’t working out despite everyones best efforts. They had a big impact like teams dissolving; people leaving teams or even the company. That category of events. Something like that is decidedly not fun. But it’s necessary to have these conversations. I’m grateful to people who have the guts to bring up the crucial topics even if it hurts in that moment. After the dust has settled everyone is better off, because a harmful situation has turned into a new beginning. And work in general, not just that the retrospective, has a chance to be fun again. My gnarly problem is that I have one member of my team that doesn’t like to participate in our ceremonies. Her body language shows it, but her words never do. She doesn’t really talk during any of the ceremonies, just tells our manager that she thinks they are a waste of time. I just can’t get her to engage! Any help on this? This seems to be a very common problem. I’ve certainly had it. That’s why I want to share an edited version of my answer here. 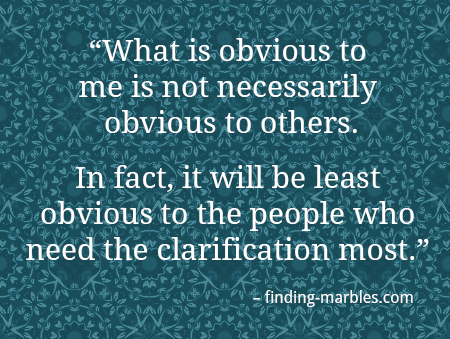 I try to keep a focus on retrospectives although it seems to be a larger problems. In a live coaching situation there are loads of good questions to ask: How does the team react? Was there ever a retrospective during which she was engaged? What is she like outside of the retros? Without knowing many of the specifics, here is some generic advice. In general, I’ve stopped forcing people. As Marshall Rosenberg said, you cannot make people do anything. 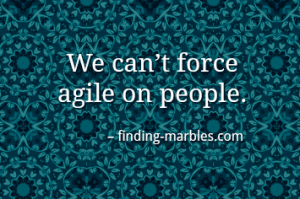 We certainly can’t make them “be agile”. If she doesn’t want to be there, she won’t engage. What would happen if she didn’t have to come? How would that affect the team? How does it affect the team now that she’s not engaging? I’ve often seen teams invest a lot of energy trying to include someone who didn’t really want to be part of it. Not everybody is cut out for agile. Not everybody can be won over. That’s okay. Time will tell if she wants to work in an agile team or not. Sometimes it’s best for everyone if someone leaves the team – As graciously as possible: Let everyone save face. Certainly no mobbing! But we’re not there yet. Everybody deserves a fair chance and we’re trying to include someone. She gave a reason for her disengagement, at least to the manager. And it’s a valid reason. Veronika Kotrba and Ralph Miarka taught me: “Everybody is the expert for their own situation”. If she thinks it’s a waste of her time, then it’s a waste of her time. Period. The question is: What would make it worth her while? 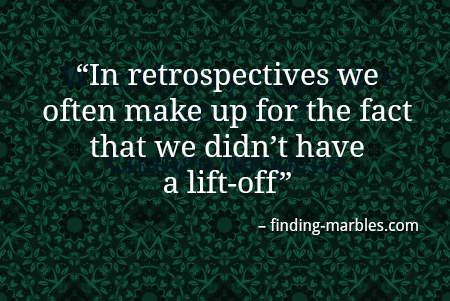 What can you do if retrospectives repeatedly go sideways? When I started out as a Scrum master I thought my only option was to carefully choose activities to nudge people into the direction I thought they needed to go. And for some situations that works well. Either Deborah Hartmann Preuss or Steve Holyer said that in a conversation and it rang true. Very few teams get a proper liftoff and they lose weeks and months of productivity to initial friction. In contrast, a proper liftoff sets up a team for success by laying a solid foundation of agreements and shared understandings. Then the team doesn’t have to spend their retrospectives patching up problems that could have been avoided. Need an idea for your next agile retrospective? Or 127? Retromat eBook! Wow, this was a looooong time in the making, but it’s finally here: The Retromat eBook! 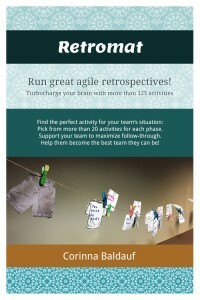 So, if you’ve ever wanted to front-load your brain with each and every activity in Retromat, check out the Retromat eBook! PPS: Interested in retrospectives? Sign up to the Retromat newsletter to get related news and tricks! How do you keep track of time when you facilitate a retrospective or other meeting? How do you make sure you all keep short timeboxes? A timer on a smart phone is one way to do it, but for me it lacks visibility. I forget the timebox and only remember it, when it’s used up. What works beautifully are TimeTimers. With a TimeTimer you set the timebox by pulling out a red disk. As soon as you let go, the red disk slowly starts retreating back below the white parts. That way you always have a pie chart of the remaining time. 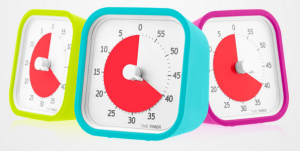 Elegant, easy to use and it communicates time very effectively!